From left to right: Lissa Wray Beal (Providence); Rachel Krohn (Wycliffe); Marion Taylor (editor of the volume; Wycliffe); Christiana de Groot (editor of the volume; Calvin). One of the highlight’s of this year’s CETA (Canadian Evangelical Theological Association) conference was the panel discussion on the newly released Women of War, Women of Woe: Joshua and Judges through the Eyes of Nineteenth-Century Female Biblical Interpreters. I’m only just now finally reading this superb volume, and I am struck by several things. First, in all of my biblical studies classes, the focus has always been on historical critical interpretation. Citing theological sources, or biblical commentaries that were more than 20 10 years old was considered bad research. Newer was always better. I think this methodology feeds into the problem I identified in yesterday’s post that the modern age suffers from a self-centred historical amnesia in which we are the enlightened generation and we are the first and only to consider the “obscure” passages of Scripture and we read them, or “recover” them because no one else before us has, supposedly. Second, in my context, very often the attitude is “all we need is the Bible and nothing else.” This then sidelines theological reflection and historical reflection, and we end up with an anemic theology of Scripture, one that forgets that the same Spirit who is the author and inspirer of Scripture is also the author and inspirer of the Church community. Reading Scripture should be an ecclesial and communal endeavour. Third, what would it have looked like if in some of my biblical studies classes, the professor had included some sort of historical interpretation text so that students could see how Christians throughout the ages have read the Bible? Would I have been more likely to gravitate towards biblical studies rather than theology? A must-have for students of Biblical Studies. This is where this new volume comes in handy. Taylor and de Groot have gathered excerpts from thirty-five nineteenth century women who commented on eight women in the Old Testament books of Joshua and Judges. These excerpts are short enough, and have a good basic introduction to the life of the female interpreter, that a professor could easily create reflection exercises, group discussions, or student presentations, that integrate, rather than supplant, the main biblical text of an OT class, either on Joshua & Judges specifically, or an OT historical books class more generally. …It may be considered another proof of the essentially feminine character of Deborah, that Barak should have laid so much stress on her appearance among the children of Israel at that time. The human mind is far more affected by contrasts than similarities. Had Deborah been a fierce, stern, masculine woman, she would have aroused no enthusiasm, her character would have approximated too closely to their own — she would have ben a sort of second-rate man, instead of being as she was, “A perfect woman, nobly plann’d/To warn, to comfort, to command.” It was the presence of a thoughtful, spiritual, intellectual woman as a leader of the armed host, that awakened energy and strengthened hope… (pg. 70). Taylor and de Groot have done a fantastic job. 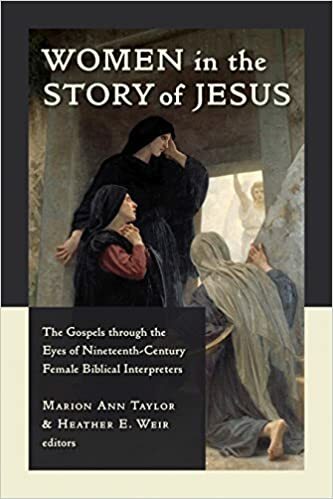 And I’m looking forward to Prof. Taylor’s (co-edited with Heather Weir) next volume Women in the Story of Jesus: The Gospels through the Eyes of Nineteenth-Century Female Biblical Interpreters. Forthcoming this fall! Stay tuned!